Courtesy of The Internet Archive’s remarkable Classic TV collection, and the Auto-Lite Theatre. Remember, you’re always right with Auto Lite. 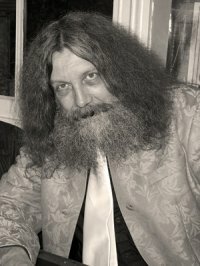 The movie Watchmen was made without the consent or participation of the writer of the book, Alan Moore. Out of respect for Mr. Moore, members of this group should wait at least one week (preferably more) after the theatrical release of Watchmen to watch it, as a small protest to the consistently poor treatment of Mr. Moore by Time Warner and DC Comics. DC comics, it should be noted, has a long and notorious history of poor treatment of cartoonists, going back at least to screwing a couple of teenagers out of the rights to Superman. I am not arguing that it is wrong to go see the Watchmen movie if you really want to. I am just suggesting you wait a bit to see it, out of RESPECT for the person who wrote it, as his wishes for it are not being honored. I repeat… this is an issue of RESPECT. It is not a legal issue. It is not an issue of artistic merit, or lack thereof. It is not even an issue of being completely sick of seeing marketing for this movie everywhere, even though I certainly am. It is an issue of respecting the intent of an artist whose works you respect. Furthermore, a week is a VERY small time to wait if you really want to see this thing. It is an important time to the Time Warner Corporation, however, as how a movie is received in its first week very much effects how successful it is overall. I’ve read many objections to Mr. Moore’s complaints about the film. Yes, Mr. Moore was doing work for hire… yes, he sold the rights to Watchmen. It was certainly a bad business deal. Mr. Moore signed a contract where the rights to Watchmen would return to him after the book had been out of print for a designated period of time. At the time Watchmen came out, there was no precedent for a graphic novel NOT going out of print. Watchmen, Dark Knight and Maus changed that. Mr. Moore naively thought at the time he signed the contract that he would get the rights back, and DC Comics was happy to exploit him. Regardless of whatever mistakes Mr. Moore has made in this instance, his works have greatly enriched my life. Out of respect for him, I don’t think it is asking a lot to wait a week or two to see whatever travesty they have made of his book on the screen… or, better yet, you could choose not to see it at all. The book is still on the shelf, and will always be the best way to experience this masterpiece of comics fiction. Why not do yourself a favor and read it instead of watching the Hollywood aberration? If you’ve ever read and enjoyed any of the wonderful works of Alan Moore, please consider affording him this extremely small favor. Here is an interview with Alan Moore on the subject at Entertainment Weekly. Here is an overview of Mr. Moore’s history with the movie business from the New York Times. For another view on this, see this interview with Watchmen artist Dave Gibbons, who approves of the movie. Slime-coated Hollywood producer Don Murphy calls Alan Moore a hypocrite and a liar, and completely misses the point, as you would expect. A while ago, I called your attention to a Bollywood Superman and Spiderman video. I ran across a few awesome new blogs yesterday that I was previously unaware of… one of which was Cool-Mo-Dee. 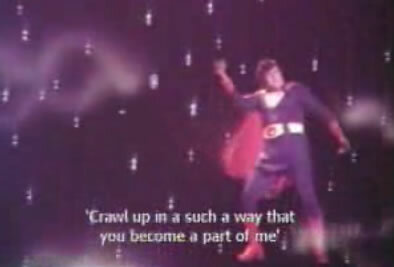 In one post, they called my attention to another great Bollywood Superman video… go here to see it. The world’s strangest presidential election. So Maybe The Future Is Free-Plus? And neither of those have a goddamn thing on Turkish Star Wars. So just shut the hell up about the goddamn Watchmen trailer already, goddammit. Now Turkish Watchmen, that might be worth seeing! And this is fifty trillion times more interesting than the Watchmen movie trailer.